Yesterday was Columbus Day, which means summer is firmly in the rear-view mirror and the temperatures are dropping. 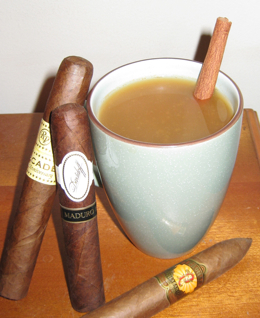 If you’re smoking cigars outdoors, you may be looking for a drink pairing that will help keep you warm in the cold. Here are five drinks that will do the trick. Hot Toddy — A classic that can be made with scotch (save the single malt, use a blend), bourbon, or even brandy. It’s simple to make. Just add sugar, lemon, and cloves to boiling water and your spirit. Hot toddies pair well with Connecticut-wrapped, milder cigars. Stonewall Jackson — An American classic consisting of hot cider and bourbon (but rye, Tennessee whiskey, or even spiced rum fill in nicely). As I’ve written before, it’s a late fall drink that pairs nicely with stonger cigars, like the 601 Green or Fausto. Hot Buttered Rum — Perhaps my favorite of the bunch, hot buttered rum is a little more complicated to make than the above drinks, but after you make it a few times you’ll find that it’s really not to difficult. Drink yours with a medium-bodied Honduran or Nicaraguan cigar. Mexican Hot Chocolate — While there are lots of recipes out there, “normal” Mexican hot chocolate is spicy and intense with unsweetened chocolate, cinnamon, and chiles. Adding some tequila kicks it up a notch. While I use something similar to this recipe, I might also add a splash of triple sec. Sip on one with a cigar wrapped with a San Andreas maduro wrapper. Coffee — There are lots of ways to make coffee (have you seen a Starbucks menu lately?). It still remains my regular pairing with a cigar. And although you can add almost any spirit to it, I almost always take mine black or with just a splash of milk. It will keep you warm while you enjoy your cigar, and coffee pairs well wih almost any cigar out there. Mexican hot chocolate with a kick of tequila! Holy heartburn heaven! I think I'd have to stick with my default mocha latte to warm me up. Never been a fan of hot toddys. I am a big fan of Stonewall Jacksons using a cheap spiced rum (like Captain Morgan) instead of bourbon. All these sound like great pairings with a cigar, I rather enjoy some earl gray or other medium to full bodied tea with my smokes. Doesn't dilute the flavor of the cigar, if anything it enhances it, and it keeps me warm when the temps go down below freezing!